It was a double whammy on Friday night at the American Airlines Arena in Miami, where fans of Kendrick Lamar and Kanye West were treated to two great performances by the hip hop greats. Kendrick Lamar was a great opener for this show, being a sort of young Kanye himself. The 26 year old performed his songs with projections of videos portraying inner city black life. There were videos of marching bands, black hair salons, and teenage girls walking alone on railroad tracks, or down the road. This imagery reflects Lamar’s style and lyrics, a darker side of hip hop, but a real expose on life for Lamar. 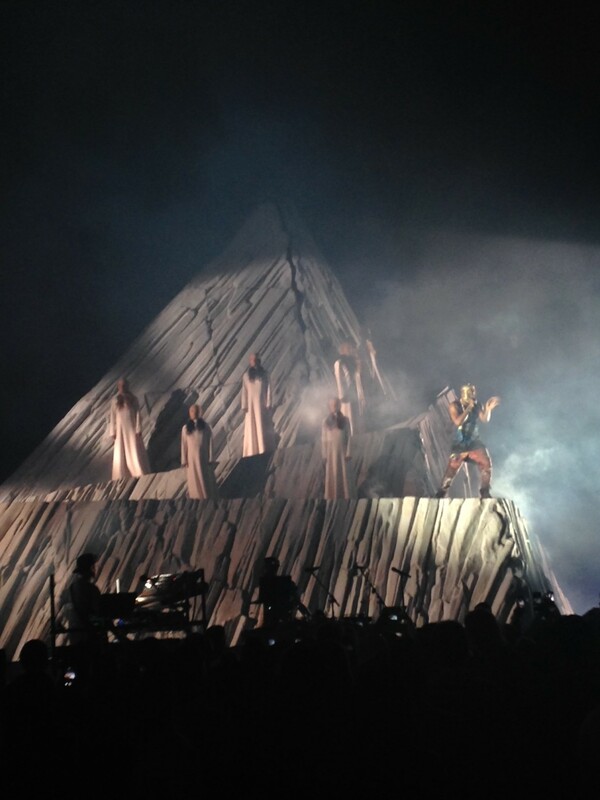 It was a great performance and warm up for Kanye, although ear-bleedingly loud. After Lamar, the real fun began… Kanye’s concept and performance for the Yeezus album was deeply thought out, yet somewhat unnerving. Making use of stage design and back up dancers, Kanye was able to portray an eerie Alexander McQueen-ish aesthetic, which left me pondering what it all really symbolized. The set design consisted of a long runway that stretched out into the audience on the floor, a large mountain top that had ridges and angles for people to walk along, and a large circular screen above the mountain which projected images of moving clouds, constellations, and imagery from the performance. The show was broken down into five “acts”: Fighting; Rising; Falling; Searching; Finding. Within each section, he performed songs that reflected the sentiments of those words, and perhaps moments in his life in which he felt he was fighting, rising, falling, searching, or finding (finding Jesus, that is). The show began with 11 girls in long-sleeve white cloaks, similar to the style of a nun or Lady Gaga. They had beige nylon covering their faces, with long scraggly pig tails hanging down; it was quite an eerie aesthetic, and perhaps something one might see in a nightmare. With Mozart playing backwards as the girls slowly walked toward a spotlight beaming down onto the center of the runway, a voiceover came on and described the definition of “fighting”. Kanye then appeared in a diamond encrusted mask, which resembled something Bain would wear if he cared about fashion. This mask would remain on for the rest of the show, covering his entire face, to the point people were questioning if it was really Kanye under there. He opened the show with a previously unreleased track from Yeezus, “I Am Not Here”, which led right into “On Sight”, the first track off Yeezus. 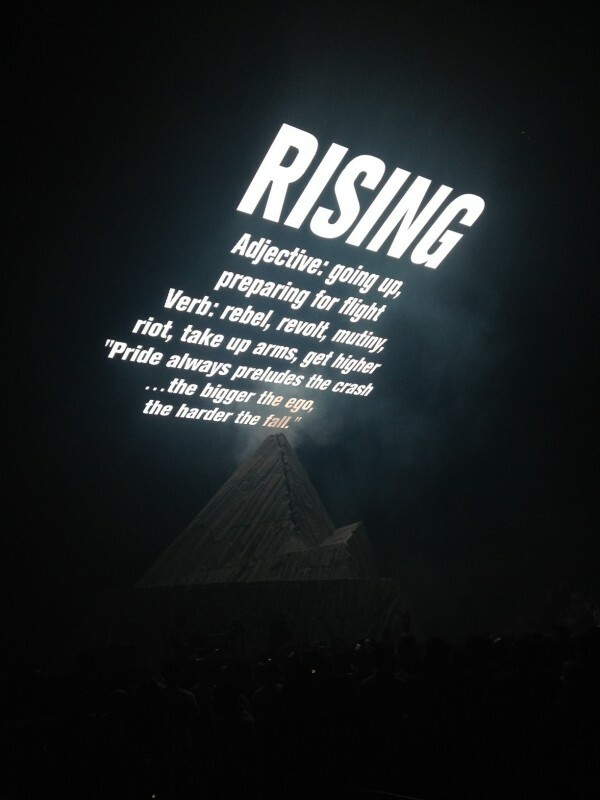 After performing “New Slaves”, “Send It Up”, and “Mercy”, the show went into it’s second act: Rising. The word was projected on the screen above with the voiceover of a woman telling us the definition. The mountain shifted and split in two, making way for a runway right through the middle of the mountain. 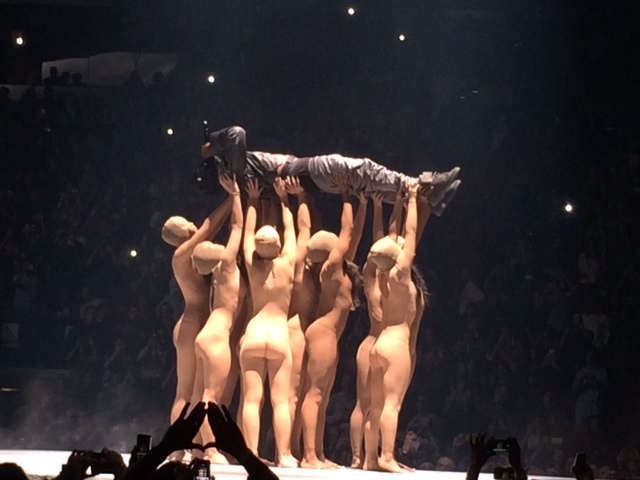 It was in this act that he performed songs like “Power”, “Clique”, “Black Skinhead”, and “I Am God”. This could be interpreted as his own personal rising, in his career and his life. After performing his song “Can’t Tell Me Nothin”, Kanye spoke with the crowd about his mother and her passing in 2007 (she died of post-cosmetic surgery complications leading to heart failure), which then led us into the third act, Falling. This could be interpreted as one of his lowest points in life, when his mother died, and he split from long time girlfriend and fiancé Alexis Phifer. He performed “Coldest Winter”, lying on his back and dangling his legs from a now raised runway, with snowflakes falling over him. Throughout the Falling act, there was a mountain beast that was always lurking around the stage, with laser red eyes and a hunchback. The next act featured the word Searching, which began with another voiceover describing the definition, and Mozart music in the background. Kanye, still masked (although he did undergo a few mask changes), performed “Lost In the World” and “Runaway”, before continuing on to act 5, Finding. Kanye performed “Stronger”, before launching into a 20-minute monologue ramble that had everyone rolling their eyes and shaking their heads. I checked out at this point, but I know he was rambling about being rich and powerful and being able to “split a mountain” (referring to the stage design). It was ridiculous, but not surprising. He also mentioned that his fiancé and Pharrell were in the audience that evening. 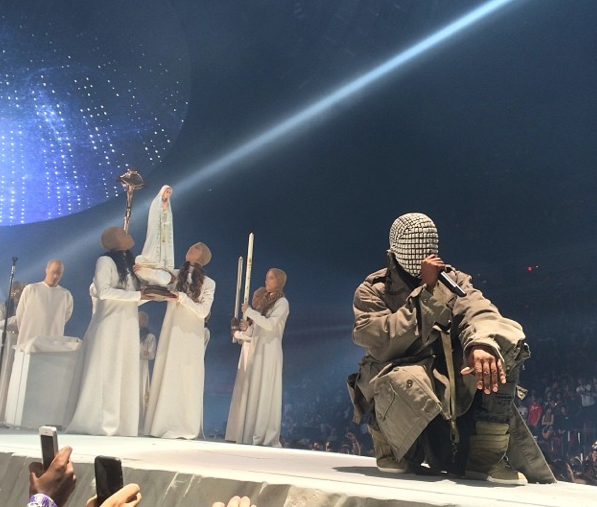 It was at this point that a robed Jesus walked out on stage, and Kanye immediately fell to his knees, proclaiming “White Jesus!” While down on bended knee before Jesus, Kanye ripped his mask off, and closed his eyes, bowing in humility to the Savior. Everyone went nuts at this point, the revelation that yes, it has been Kanye this whole time (phew!). 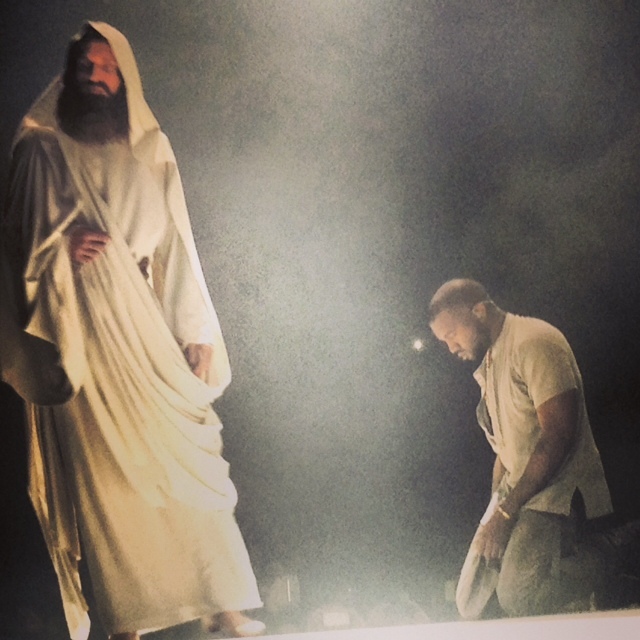 Jesus touched Kanye, and walked with him for a moment, before walking off the stage and then reappearing on the mountain top. I didn’t get the feeling that Kanye was mocking religion in any way. What I got from this performance is that he has seen dark days, and an inner darkness exists, however he has been able to come out on top with the belief and faith in Jesus. This act included songs “Jesus Walks”, “Flashing Lights”, “Good Life”, and he closed the show with “Give Us What We Need”. Overall, I really have to give it up to Kanye, for being an artist. It’s obvious that he has a lot of ideas, and a thorough artistic aesthetic. Other than the twenty minutes of rambling, I would love to see him again, as it was a captivating performance, and left me with a lot to interpret and think about.